Iliotibial Band Syndrome is a common problem with runners and cyclists and those who have suffered an injury. The iliotibital band, commonly known as the IT band, is a band of tissue extending from the hip, along the outside of the thigh and knee. With “Iliotibial Band Syndrome” the IT band becomes very tight and sore, making it difficult to exercise. How does Iliotibial Band Syndrome (ITBS) occur and what can you do about it? ITBS occurs when the IT band becomes inflammed during repetitive flexion and extension of the leg in running, biking and hiking. I would offer another perspective, because not all runners, cyclists and hikers suffer from a tight IT band and/or accompanying knee pain. The most common muscular pattern I see in people with IT band pain is the Trauma Reflex. The photo at right is of a recent client – a soccer player – who complained of right sided iliotibial band pain, hamstring and knee pain. It is a perfect example of the trauma reflex. The waist muscles on the left side of his body are tighter, hiking the left hip up higher than the right. His left shoulder is pulled down in response to the tightening of the waist muscles. The shift in his pelvis causes him to shift his weight to his right side. When this occurs, the pelvis is pulled out of balance and twists slightly. This can occur if you’re a runner who slips in the mud, or a cyclist who falls off his bike. This Trauma Reflex alters the gait in such a way that one will run or walk as if he were a car with one flat tire. This kind of accumulated muscle tension on one side causes the IT band to tighten in order to stabilize the relationship between the pelvis, hip and knee. In this client’s case, we did a clinical session for the trauma reflex, and in one hour, his hamstring, knee and IT band pain disappeared once he learned to even out his waist muscles and regain symmetry in his pelvis. Stretching fascia that is attached to muscles that are constantly contracting suggests a lack of understanding about how the muscular system works. Fascia is tight because the muscles are tight. Muscles become tight through habituation – in the case of IT band pain – a Trauma Reflex, which creates a postural imbalance. Because muscles are controlled from within – both voluntarily and involuntarily fascia will become more pliable once the muscles relax. Fascial work is an example of attempting to fix the problem from the “outside in” when in fact, it can only be fixed from the inside out – through sensory motor retraining. Learn to change the way in which you sense and move your muscles you are on road the targeting the root cause of your pain: your brain. Visit the Essential Somatics® store to learn to relieve your muscle pain in the comfort of your own home. This entry was posted in Health & Movement, Pain Conditions Helped and tagged hip pain, iliotibial band pain, Iliotibial Band Syndrome, ITBS, knee pain, Somatic Stress Reflexes, stretching, video. Bookmark the permalink. Thanks for posting this.Might help my cranky hip..
You’re very welcome! I hope it helps your hip, too! How are the basic somatic exercises going? Correcting that trauma reflex will make all the difference in the world for your hip. Don’t forget that I do online Skype sessions; if you need help, let me know. These Skype sessions are the next best thing to getting a hands-on session. I purchased your book and wondered if any of the exercises target tight hip flexors. Given our collective propensity for sitting, it seems like the flexors would be a common tight spot. Or do somatics not apply to connective tissue in the same way as muscles? Yes, several of the exercises in the book and on the “basics” DVD (a great accompaniment to the book) and the “Pain-Free Legs and Hips” DVD target the hip flexors. As I wrote in my iliotibial band post, when you target the center of the body, the periphery begins to work better. Same goes for the hip flexors. Tight hip flexors are part of a full body pattern that begins in the center of the body. For most people, sitting involves a bit of slumping (red light reflex) or over arching (green light reflex), both of which are an extreme that put pressure and contraction on the hip flexors. Address the pattern, find “neutral” when you sit (the “seated awareness exercise” in the book), and the hip flexors will begin to relax. Think about sitting for long hours absorbed in an important task (or a boring one): there’s also an emotional component. That’s a whole other issue and one worthy of its own blog post! Here are the exercises that can help with your hip flexors: side bend, washrag, steeple twist, flower, invert/evert, propeller, the back lift and any and all of the “standing somatics” exercises. The back lift addresses the back muscles – yet in order to contract the back and lift the leg, you must release and lengthen the front of the body. I would also emphatically suggest that if you sit for long hours for your work, you make a concerted effort to get up at least once an hour to do the “reach to the top shelf” exercise, and a diagonal reach (in the “standing somatics” section of the book) in order to remind your entire body that it can move. I hope I answered your question adequately. And how are you enjoying the book? Love, LOVE the book. I do the 15 minute routine over the course of 3-4 5 minute blocks over the day. I actually got my 60-something Mom on the floor doing same (and she is quite the skeptic). I work from home from a treadmill desk, so I’d like to think that I incorporate movement throughout the day. Wow! A treadmill desk? How fortunate – and intelligent – you are to have created such a set-up for your work. I’d love to see a photo of it if you can send one. I’ll put it in my blogpost about sitting, hip flexors and our emotional responses to long term sitting. Thanks for the kind words about the book. And good for you to get your mom on the floor doing Somatics. It was my own mother (75 at the time, 83 now) and my then 52 year old sister who introduced me to Hanna Somatics originally. My sister is now 59, an active farmer, and my mother is 83 and still hiking. And they both do their Somatics daily. One more thing….I would be so grateful if you’d write a review on Amazon.com about the book. My vision is to reach as many people as possible with this work. It’s what Thomas Hanna wanted us to do: teach people how to take back their own health and movement. Will do. I got my desk here: http://www.trekdesk.com/ . I am sure there are other options, but I am very pleased with their “one-size-fits-all” solution. Thank you for posting this exercise – a great addition to my (now 2x) daily somatics routine! It seems that runners with IT band issues are often told they have weak glutes – or, more accurately, that they aren’t engaging their glutes. As they go into weight-bearing on one leg, the pelvis “collapses” with the free hip dropping and the supporting hip jutting out to the side, putting undue strain on the TFL/IT band. So, in addition to foam rolling the IT band, we’re also told to strengthen our glutes with exercises like one-legged squats and deadlifts. If we’re lucky, we might be given an exercise such as hip hitches and one- or two-legged bridges to help engage the glutes. But none of this does anything to actually retrain the brain so that it properly coordinates everything during the actual act of running! As mentioned in your IT band video, we should also be doing the “walking” exercise. For me, this exercise was instant gold! The a-ha moment came during part two, pushing the knee forward and pressing the foot into the floor. Instantly, I felt the proper hip action, with the supporting hip being drawn over the supporting ankle/foot (instead of popping out to the side). I was even more surprised and thrilled when I noticed it during my walking warm-up and subsequent run. No that I have the skill, I can go on to build endurance and strength. Thank you! In which dvd does it show how to do the “walking” exercise? Which is the BEST dvd for IT band pain? Thanks!! The best DVDs to purchase if you’re having IT band pain are the “basics” Pain Relief Through Movement DVD and the Pain-Free Legs and Hips DVD. The basics takes you through all the important exercises that begin to help you regain awareness, release and control of the back, waist and abdominal muscles. The “walking exercises” are also on that DVD. The legs and hips DVD gives you more exercises that focus more on that area. The walking exercises is on that one, too. I recommend both because as I wrote in the blog post it’s best to regain symmetry and control of all the muscles that move you as a whole rather than just targeting one area. The brain organizes us as a system, so when you improve the entire system (like updating the software on your computer), you have less muscle tension and more awareness and more capable of moving easily and efficiently. When you say flex the foot, do you mean to point the toes down or up? Flexing the foot is pointing the toes up. This contracts the front of the lower leg. Pointing is bringing the toes down, which contracts the calf muscle. Having suffered from ITB syndrome for 2 years (and not having any joy from the medical profession), I set about trying to work it our for myself. I know I have a very obvious trauma reflex (didn’t know it as being called that though!) with my left hip lower than my right (ITB /hip pain is on left side). Having seen this familiar pattern on your website, I am now going to try the itb release sequence for a while – howmany repeats should I do and how often? What I would do first is to spend about 10 minutes doing some general somatic exercises (free on my website: arch and flatten, arch and curl, side bend, washrag) – then do the iliotibial band release in this post. Repeat the release 4-6 times SLOWLY. Repeat other side. A nice experiment would be to do the washrag again and see how that feels. Both sides should feel a bit more balanced. Then stand up, walk around a bit and see how you feel. That’s great Martha – thank you so much! I experimented with the ITB release for the first time the other day just to try and get the technique in my head (and body!) – for the first time since I have been trying to get to grips with this thing, I felt an ‘ah-ha’ moment (ITB ‘stretching’ never even started to make an impact). I will certainly let you know how this goes – very many thanks again! You are so very welcome! I’m so glad you had an “a-ha!” moment with the IT band pandiculation. The aspect of Hanna Somatics that I love the most is being successful in teaching you to take back your own physical awareness and control. The end result is FREEDOM. Who doesn’t want that, right? wait to keep going with this and start to transfer it to running over a period of time. I’m a Health and Fitness Specialist and a massage therapist also so I’m really intrigued to be delving into somatics first-hand! Thanks so much again. I just wanted to thank you – I am a runner and have been struggling with it band issues and pain in my hips since the fall (and when I stop to think about it the discomfort has been present for far longer). I tried this for the first time last night after being at my wits end after a week of not running and I was still unable to walk comfortably let alone run. Today I noticed a significant improvement – I did the above exercise and well as the side bend and wash rag. Wondering what you recommend in terms of returning back to my running routine – I typically run between 40-50kms per week and I’m keen to get back at it. For the last 3 weeks I have run significantly less and then not at all for a week. Other research I have done seems to suggest taking long periods of time (up to 6 months) from running in order to recover from it band pain. I’m so glad that you feel that the answers I’ve given regarding IT band issues makes sense to you. The somatic exercises will help you to slowly and intelligently retraining the brain to release the muscles that are causing your pain. It sounds to me as if you are stuck in a typical “trauma reflex” pattern. You’re correct in assuming that it’s not just your IT band that is the problem: it’s the full body pattern of muscular contraction that is the source of the problem. Or more specifically – iliotibial band pain develops due to sensory motor amnesia (the condition of chronically tight muscles that won’t let go) – your brain has taught your muscles to stay “frozen” and tight due as a compensation/adaptation to stress. When you have a fracture, your brain contracts the waist/trunk rotator muscles instantly in order to prevent further pain, or to compensate until the injury is healed. It’s extremely common and easily reversible. If only doctors understood that when it comes to muscular pain and dysfunction they can’t help us if they look at us as if we were a car or a toy that needs fixing. The answer lies in our brain and its ability to sense and control muscles. Iliotibial band pain isn’t a medical problem; it’s a functional problem. This is the expertise of Hanna Somatic Educators. Enjoy learning the exercises. Let me know how things go. I couldn’t agree more. How one moves and the patterns they form says it all. Add to that the way the brain reflexively responds in certain ways that are common to all humans. It’s much less mysterious than we are led to believe. Now to get the medical profession to pay attention and utilize this information! Hello Martha, first and foremost, thanks for all the info available on this blog and the help you are providing to people in need, it’s truly inspiring. I have long suffered from pain in the right knee, and also pain where my hamstrings and glutes meet whenever i sprint. I went to see a chiropractor, and we concluded that i have an unbalanced pelvis, that is higher up on the left side, which makes my spine curve inorder to balance things out. He did however say, that it is a anatomical problem(left leg longer than the right), but as i have done some researching, it seems like 95% of unbalanced hips are actually functional, and he only took x-rays of my hips where i was standing normally, and didn’t do any form of measuring. I have now given up on the chiropractor to fix my problem, and was hoping you could give me a hint on which of your exercises should be done daily in order to fix the problem and regain balance in my body. I tried this for the first time tonight. I am a runner, 27 yr old female. I have run two marathons and I’m training for my third now. I have had a lot of knee pain since I started running 4 years ago. This training I’ve had a lot of hip pain, tightness and tenderness. I am wearing itb knee straps and stretching, doing dynamic stretches before and static after running. I try to do foam rolling but it is so painful and takes so much time so I get lazy. Plus i have been traveling the last 6 weeks and that always makes my body tight and sore Was looking for stretches online tonight and found this site. I’m hesitant to believe this simple video could heal my aching hips, but it’s worth a try! What would you recommend and how often before first noticing improvement? Make sure to read the blog post thoroughly so you understand how iliotibial pain develops due to a FULL BODY pattern of sensory motor amnesia – in this case, the trauma reflex. This is really important. It is hard to imagine that after trying myriad different gadgets and solutions for IT band pain that a release such as what I demonstrate in the video would help. Here’s the difference: most methods aren’t asking the right question. They’re trying to “fix” one area of the body without addressing the entire PATTERN of muscular dysfunction. Muscular dysfunction develops due to stress adaptation. Address the root cause (the brain and the way in which it senses and controls muscles) and voila! you get amazing results. Your brain caused the problem in the first place, so your brain needs some re-education. It’s simple and straightforward. I’ve had some wonderful feedback on this particular release. Enjoy it and use it whenever you need it. Here’s my suggestion, however: in order to address the full pattern of what’s ailing you, purchase my “basics” DVD and my Pain-Free Legs and Hips DVD. Begin to learn the basics of Hanna Somatic Exercises. I’m not a runner, but as a former professional dancer I had plenty of knee pain. Knee pain is an indication of something not right in the CENTER of your body. If the center of the body is too tight, the periphery isn’t going to function as well as you’d like. I’ve had quite a number of runners report back with great results from learning the Somatic Exercises and even greater results from getting a series of hands-on clinical sessions of Hanna Somatic Education. Depending upon where you live that would be the best option (combined with the exercises). Hi Martha, Thanks for the interesting video. I also have pelvic tilt issues and my left IT band hurts when I attempt to train my quads in the gym. I can’t do squats, leg presses or even leg extensions without severe hip pain. So when I contract my quads, my hip hurts. Does that mean the IT band has attached itself to the quad through adhesions? Thank you for your time. Good question. No, the IT band hasn’t attached itself to the quad through adhesions. What’s happening is that, due to an muscular imbalance in the center of your body you’re recruiting muscles that normally wouldn’t need to be recruited in the same way. You have sensory motor amnesia. You need to release the reflexive and stuck pattern in the center of your body (probably the trauma reflex? I’ll bet your hips aren’t level and neither are your shoulders? ), and the IT band will release. The IT band is merely over- responding to the imbalance in order to stabilize. I would suggest purchasing my “basics” DVD and my Pain-Free Legs and Hips DVD to get started in reversing this pattern that you’re not aware that you’ve gotten stuck in. PS to Andreas – look in the mirror and take a squat stance. Begin the squat, but look at yourself. Look at the CENTER of your body, and especially at your waist muscles. Is one hip “hiking up” higher than the other? Notice the BACK MUSCLES on the same side. Tight? Unable to relax? If yes, you have a typical trauma reflex. Where are you training? Perhaps there’s a Somatic Educator in your area who can help you. I can’t play the video. Is it still available? I never took down the video of the IT band release. It should definitely play. It’s also on my Essential Somatics YouTube channel, if that helps you. Enjoy it and let me know how it works for you. Unbelievable. After struggling with a twingy knee (from tight IT band) for over a week – RICE-ing, MICE-ing, stretching, etc, I did the above exercise about 10 times and could feel an improvement immediately! Just ordered the Book/DVD. As an ex-dancer, movement makes sense to me as a solution! YAY! I’m so glad you got such great results from this IT Band release! It’s amazing what pandiculation of a full body pattern will do, isn’t it? I wish I had known about Somatics back in the 70’s when I was a dancer. It would have saved me years of frustration and incorrect treatment for knee pain. Enjoy the book and DVD! Spread the word…. I’m so glad you are getting such rapid awareness from my video. Yes, Hanna Somatics makes SO much sense, doesn’t it? Applying brain science to helping you change what your muscles are doing is simple, straightforward and uncomplicated. If you find you are getting relief from this video (and the accompanying information from the blog) I suggest that you learn the most important “basics” from my DVD. Also – if you live near a certified Hanna Somatic Educator (or Clinical Somatic Educator) a few hands-on clinical sessions would confer some very rapid relief (and awareness of what you’ve been doing to create your plantarfascitis). I’ve been struggling with back, hip, and sciatic pain for 3 years. I’ve been diagnosed with a slipped/bludging disc i went to physio and nothing helped. I finally went to a massage therapist that gave me a push to look into different things. I finally came across this and now it all makes sense after reading and watching the video I stood in front of the mirror first lined myself up in front of it closed my eyes and let my body position where ever. I was suprised to see my right shoulder sitting much lower then the left comletely not lining up. It’s finally all coming together and now I remeber a year before I truly threw out my back I had a serious injury to my right ankle where I was running and rolled into a hole about 6 inches deep. I couldn’t walk on my right properly for close to a month! Even after all that I’ve thrown my back out 3 times in three years waking up in extreme pain I almost completely tore my right ACL as well which makes sense that my right IT Band is tight. I was worried I would never fix or ever be the same again I’m 23 years old and I thought I would be stuck not doing all the things I love. Some people may not be bothered by an injury or just deal but for me being physical and enjoying a run or anything physical means the world to me. I did your routine and I feel a bit better already I feel like this is the step I’ve been missing for so many years. I felt like no one wanted to give me an answer like my Doctor he’d rather sweep it under the carpet. This is awesome! I’ll definately be purchasing your dvd and book once I finally get settled into my new home within a month! Thank you so much sorry it’s a long message but i’m way to excited! The one shoulder higher than the other, more often than not, your whole body is in a sidebend position… just with the head tilted in the opposite way and the eyes level on the horizon. When you look at yourself in this way in the mirror, you can get a new perspective. You’re so right, Alfons! The brain makes sure that your eyes find the horizon, so you don’t THINK that you’re side-bending or “crooked,” when, in fact, you really are! Looking at the full body and knowing what to look for (which you described so accurately) makes for an interesting moment of awareness. My suggestion is to go back to the blog post and re-read the explanation of the trauma reflex. IT band pain is merely a symptom of a great imbalance in the center of the body. When the CENTER of the body is off-kilter/out of balance, the IT band will tighten to try and stabilize. Address the FULL BODY pattern of muscle dysfunction (the fact that your brain has taught your muscles to work differently/less efficiently in response to an accident/injury) and re-calibrate muscle function so that the core muscles and your pelvis are balanced, and IT band disappears. This is the essence of Hanna Somatics: muscle pain and dysfunction is the result of a loss of somatic awareness and muscle control. IT band pain doesn’t happen TO you; it develops in response to a pattern of muscle function. What’s needed is improvement in the sensory motor system, not spot work on the area that hurts (ie. IT band). My suggestion is to read the book, Somatics, by Thomas Hanna, or my book, Move Without Pain, and to delve a bit deeper into this work. It can teach you to produce miraculous changes from the inside out. In the video you say to flex your foot however the camera is not on the foot! What do you mean by flexing the foot (pointing toes down?). Also I’m assuming that your it band problem is on your right side?? I know you are supposed to do both sides but I didn’t hear what side you were having the it problem. What DVD do I need for it band problem on left hip, leg? It’s possible that what you’re feeling (and I don’t know because I’m not you and can’t feel what you feel) is overly tight muscles due to a vigorous “workout” at the mini-mall. If you had to have hip surgery there were probably overly tight muscles on one side of your trunk to begin with. Compensation. While surgery may help you, the brain contracts the muscles in response to the surgery. Go for a vigorous walk when you have involuntarily contracted muscles more on one side of your body than the other, and you will continue to teach those muscles to stay tight and “frozen.” Re-educating your muscles is what you need to do – and not just the “hip” muscles, but the full body pattern that is going on in the center of your body. I address this in this post. My suggestion for anyone undergoing hip surgery is to learn how to release/relax your overly tight muscles and regain proper muscle function. This will help you recover faster and help you prevent problems in the OTHER hip in the future. The “basics” DVD, the legs and hips DVD and, if you have access to a certified Somatic Educator, a few one on one clinical sessions is the route I would suggest. I stumbled upon this blog post and share the same idiosyncrasies described. My shoulder is lower on one side and I have all the similar related posture problems that are on the surface manifesting as an IT Band issue. Which of your products would be the ideal place to start. I want to know exactly what you would use to treat everything described in this blog post. I would start at the beginning! If you’re stuck in what sounds like a “trauma reflex,” then you need to get your brain back in control of the back, front and sides of the body (the extensors, flexors, trunk rotators). My “basics” DVD is great for helping you release, relax and coordinate those muscles in a full body way so that you can then see how your IT band feels. I would also highly recommend going for a series of hands-on clinical sessions. The exercises are very powerful, yet some people need some one on one assisted pandiculation in order to really “set” their new patterns more effectively. Where do you live? I completely agree. The several “teachable moments” I have had (motorcyle accidents, knee surgery, etc) have made me constantly want to learn more about my body. I still train and am VERY fit, but am always trying to learn how to serve my body best. PS…Currently I am working on a project in Vermont, USA. I decided to start with your book and “Basics” DVD. PS. Just to be clear – there’s no way to “treat” what I describe in my post. The lower shoulder, tight hip on one side, pelvis out of alignment – these are all part of the pattern of the “trauma reflex” that I describe in my post. The only way to transform, re-boot, update, become aware of, the pattern that is your brain’s response to whatever accidents, injuries, surgeries (or, as I see in tons of people, excessive computer work), is to re-educate the brain and muscles. In Hanna Somatics we call ourselves educators rather than “therapists” or “bodyworkers,” because we can fix or treat you. We can only educate you in very specific ways in order to help you and your brain regain control of these reflex patterns common to all humans the world over. For a great read on this work, get Thomas Hanna’s book, Somatics. First of all – thanks a bunch for creating this site. I was surfing randomly for ways to stretch the IT-band which i believed i had problems with and ive learned so much by doing your exercises. But i need some further advice from you. Ive had a pain in my stomach all my life and just recently found out it was musclerelated. I tried your IT-band release after trying to stretches for literally all the muscles in my body – almost nothing gave any lasting result. Your IT-band release feels right when doing it allowing rather than forcing change to come. However – this is where im very frustrated. My main problem seems to be in my left ribcage. I fit the picture of he footballer you have but my left side is so tight that i think some nerves here have become jamed due to my ribcage beeing stuck in sideway flexion… This i believe is the source of my stomachpain. Ive tried the IT-band release for it on both side and i can eventually reach into it but it takes several hours of tension release and its very challenging mentally and overall hard to get right. I’m so glad you’re getting a lot out of my site. I’ve created it with the intention of helping people help themselves. While it’s difficult to give you accurate information about what I think is going on with you (I would need to see you and watch you move), your description of being stuck in a “sideway flexion” and having ribs that are stuck sounds like a trauma reflex. This occurs due to accidents, injuries, surgeries and compensating on one side. Your pelvis is probably out of alignment as well; am I correct? This is why the IT band release is helping: it brings in a pandiculation and release of the waist muscles, not just the IT band. 1. Purchase my “basics” DVD. You will learn the most important basic somatic exercises you need to begin reversing the pattern of muscular tightness that you’re stuck in. 2. Make an appointment for a video Skype session with me so I can assess you, watch you walk, and move. I will guide you through certain exercises to be sure that you’re doing them properly in order to get the most benefit out of them in order to reverse your sensory motor amnesia. Hi Martha,thanks for your response. Yes as you say my pelvis is out of alignment. In my front my SIAS on the rightside is higher up than the one on my left side. After reading on your page i seem to fit the traumareflex. I have a question about the sidebend which i do as my “regime” now and ilso the it-band release. As i relese out of the tenson i get muscles in my legs tightening up, my inner thighs. To me this is a sign that the release is not working properly and that i need to release those thighs first, is that right? And my next q then would be – how do i adress those thighs? I want to buy ur dvd and ur book + painfree athletes but since im from sweden u mightneed to give me some extra assisatance? Hi Again Martha. Just found the source of my pain think. Quadratus lumborum on my left side – i wasnt using it. I did some pandiculation on my hipflexor – which always hurts and i didnt pay any special atention to it. First lying down then i tried standing and compared my standing on my left and right side and i noticed i wasnt contracting my muscles in the same manner on my left side compared to my “healthy” standing on my right. So i tried to copy it – and that meant activating ql. When a muscle hurts is it always that musle that you contract realease? When you have contracted and relaxed can you just lie down/sit/stand and actively focus on the muscle and tell to relax to get it to do so? Thanks, Martha, for the informative article. My experience, like yours, is that a one-dimensional approach to stretching won’t be that effective, but a multi-dimensional approach to experiencing movement can make a huge difference. Multidimensional is the way to go. I always suggest to my clients to find something they love that will make them strong once they’ve gotten rid of their sensory motor amnesia. Do a short routine of Somatic Exercises daily, then go out and MOVE! But remember that “re-booting” the brain and muscles is a daily thing. Pandiculate often, just like animals. Hi Martha, I am trying to understand if doing these types of exercises would benefit the problem I am struggling with. I have been diagnosed with MS and am doing mostly great (I am not on medications and am using food to heal my body) except for when I walk. When I start to walk I feel normal but after about 20 minutes one or both of my legs start to get very stiff and feel like sticks. The flexibility in my knees get lost and if I am wearing flip-flops it’s hard to keep them on because my toes don’t hold onto them. I can’t quite narrow it down as to what happens and in what sequence except I know that after about 20 minutes I can’t walk at the usual pace and have to take a break. I am not fatigue during that time, none of the MS symptoms come up, it’s just my legs feel like they loos some of the motor. Do you have any recommendations? I have worked with people with MS before. Hanna Somatics can be very helpful. I would suggest either having a proper phone consultation in which I can more fully answer all your questions (and get a lot more background from you), or doing a series of online video Skype sessions, or having a series of clinical hands-on sessions in which you are more individually assessed and guided as to how you can best benefit from Hanna Somatics. Information about these options is on my website under “sessions and workshops.” Please feel free to get in touch with me. The repetitive action of standing on one leg more than the other your brain teaches the muscles of the torso/waist to contract more on one side than the other. This is why the IT band is so tight only on one side! It’s a case of “Sensory Motor Amnesia:” habituated, learned muscle tension that your brain can neither sense nor control. It’s become a habit…and habits can be changed when you know how to proceed. Doctors, physical therapy, massage therapy or other therapies that try to “fix” the problem from the outside will likely be a waste of your money. Because your brain controls your muscles and helped you to learn/habituate to standing on one leg all day, YOU can teach your muscles to release, and relax and that is what Somatic Exercises can teach you to do. My suggestion, depending upon where you live, is to work one on one for a few sessions with a skilled Somatic Educator. These sessions confer more rapid progress and you learn to regain proper muscle function and control (and balance in the center) quite quickly. Then you can do the Somatic Exercises, which are “reinforcement exercises” we teach after we see someone for clinical sessions. I also conduct Skype sessions with people, so that’s another option. No, I don’t think there’s a problem on my website, but you can always try it from my Essential Somatics YouTube channel. The IT band release is helpful, yet as I say in my blogpost, a tight IT band is the result of a pattern of holding/tightness in the center of the body that pulls the pelvis out of alignment. Your runner would do best to do more than just the IT band release. She should begin learning the basic Somatic Exercises that also release the back, waist muscles and abdominals. Arch and flatten, back lift, arch and curl, the side bend, washrag, walking exercises – all very important. Anyone with a tight IT band has a “trauma reflex” going on; it’s a predictable pattern. If she can’t come to New Jersey for a few clinical sessions (what about over Thanksgiving break or Christmas break?) she could benefit from a Skype session with me in which I can assess her and give her more individualized instruction so she can regain balance, symmetry and coordination in the center of her body. This will even out her gait and make her running more smooth and powerful. If you had a hard fall I would emphatically recommend beginning to learn the basic Somatic Exercises that can help you regain the balance you hopefully had before your fall. Going to see a skilled Somatic Educator would help you one on one to release the relax and recalibrate the brain’s control of the muscles that have pulled your pelvis and center out of alignment. This is a predictable “by-product” of a fall. I am also available to help via Skype if that suits you. At present I’m overseas teaching Somatics trainings, but will be back in the US in mid-December. Only you can fix this problem, since it’s your muscular system and brain that had to respond to the stress of your fall. The medical profession simply doesn’t have the information to know how to deal with it because the problem isn’t medical in nature. It’s a functional problem of the sensory motor (movement) system. First of all thank you so much for the information you provide. Is there release techniques specifically for tight quadriceps? Especially my rectus femoris seem to be very tight. Thank you. Yes, you can pandiculate quadriceps the same as any other muscle group. I have pandiculations for the quads on my “athletes” DVD. You can also pandiculate them by doing simple “plies,” like they do in ballet class. That way you pandiculate both the hamstrings AND the quadriceps.The quads don’t work in isolation, so it’s best to re-educate all both the quads and hams together. 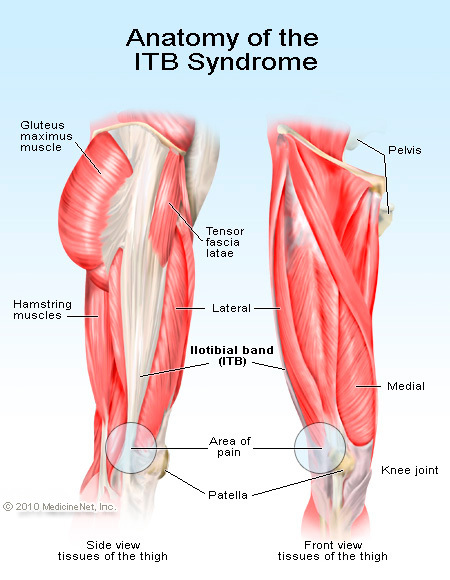 I felt I should let you know that you’re probably the only person on the internet that has it right about ITB syndrome. I suffered for 10 years! It started after a period of running. Stretching, training my hip muscles.. nothing worked. One day I started doing pull ups to strenghten my shoulder and back muscles. Gradually, my hip pain reduced to almost disappear completely after a few weeks. You are absolutely right.. the problem lies in de center of the body. Pull ups strenghtens ones complete upper and center body. It’s a natural way for improving ones functional strength. Training the Latissimus Dorsi, corrects the faulty hip position. It seems so logical, but nowhere this is suggested as a treatment for ITB syndrome. Just give it a try. Start slow.. one, two, three pullups. Search the net for training programs. Pull up bars that you can mount at your door are cheap and easy. And here’s the thing: the ITB is a tendon. It can’t be – and shouldn’t be – stretched or foam rolled. It’s not the issue. The ITB attaches to the knee and up into the tensor facia lata. Change the function of the leg and hips and the problem is solved. Reverse the trauma reflex that creates an imbalance in the pelvis (and thus in the legs/ITB, etc) and voila! – no more pain. Pull ups are great, yes. Yet the lats, obliques and abdominals are also involved. You need to be able to full contract and slowly release the obliques on both sides. This is the beauty of the side bend and washrag. This seems to match perfectly a problem I’ve had for the last 15 years or so, and for which I haven’t found satisfactory treatment so far. It was this website that made me realize the tightness in my left glute could be related to the IT band pain. Walking on the treadmill while working (I bought a standing desk) has helped with the left glute pain. And rolling the IT band on a foam roll has helped with that. But because I’m still unbalanced, I think walking on the treadmill has put too much pressure on the right calf, which now gets really tight after just couple of hours on the treadmill. Thank you for this greatly useful post. I’m not sure why the video isn’t working. Try viewing it on my Essential Somatics YouTube channel. The IT band release is, indeed, very useful, and is a variation of one of the most important basic somatic exercises you would ever need to reverse a trauma reflex: the side bend. Have a look at that on my YouTube channel and notice what you feel as you learn to regain control of the muscles of the waist. IT band pain is a PATTERN of tightness that starts in the somatic center. There are more movements that you can benefit from learning in order to fully regain brain control of the muscles that you don’t realize you can’t control! Thanks for your video. (I watched it on Youtube, worked fine there.) I’m confused about the trauma reflex and the idea of rebalancing the muscle tightness between the two sides of the body because, unlike many others, who have IT Band pain on just one side, I have IT Band pain equally on both sides. Think about it: if you have tight IT bands on both sides, where do you sense (do this for yourself) the tightness in the CENTER of the body? Tightness in the center, in the muscles that attach into the hips and allow the pelvis to move freely in walking, will hinder not only walking, but simple balanced standing and leg movement. My suspicion is that you are tight in the front, and back of the body (red light and green light), making pelvic movement and thereby leg movement, more laborious and painful. Is this what you feel?